Visit this izakaya on any given night and you’ll find mostly Japanese businessmen huddled around the tables chatting loudly over rounds of beer and a selection of cold, fried, stewed and grilled items. 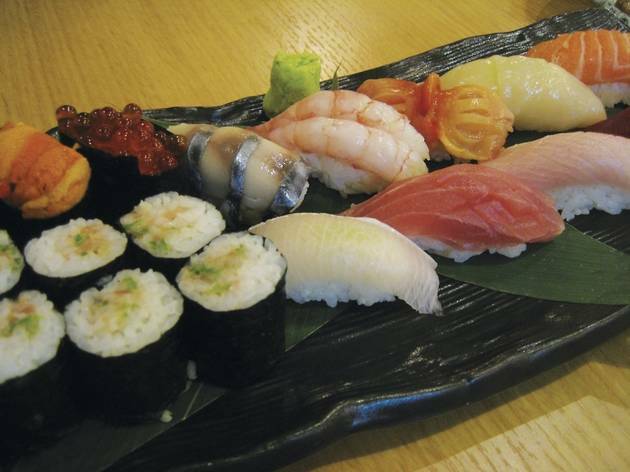 The menu is extensive with plenty of yoshoku dishes (Japanese-style Western food) floating between the pages. The pasta salad, for example, is made with al dente spaghetti noodles, julienned cucumbers, ham and mesclun greens tossed with bucket loads of Nippon mayo. The small serving ($38) is enough to feed two but should only be ordered by die-hard Kewpie fans. Stewed pork is much more traditional – a few fat-laden hunks of meat simmered in sake and sweetened soy sauce until tender. It’s good, but not nearly as flavourful as the thick slices of sauce-soaked daikon radish that accompany the pork. Our favourites here though are the grilled oysters ($68). Served on the half shell and smothered in miso paste, the plump molluscs are sweet and briny all in one bite. 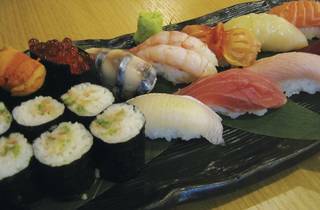 If you must get sushi, Ofukuro offers several choices, such as a deluxe platter ($380) that pits together 12 pieces of nigirizushi (including sea urchin, salmon roe, arc shell, scallop and yellowtail) with six negitoro maki rolls. The staff also encourage seasonal eating and are quick to recommend the day’s freshest fish sliced into thin slivers and fanned around a plate. If you visit during the colder months, expect firm-fleshed gurnard sashimi (mp) served with a small dish of soy sauce and wasabi and ponzu with scallions and grated radish. 3/F, 10 Prat Ave, Tsim Sha Tsui, 2312 0520. Daily noon-3pm & 6pm-midnight. Dinner for two: around $600.